Mr. Moorthy, TRO's coordinator in Vaharai further said more than 7000 civilians were gathered at the hospital site in Vaharai Sunday morning as TRO volunteers buried six civilian's bodies brought from Kandalay IDP camp area. Meanwhle, a female patients of the 10 critically wounded among the 26 patients admitted at Vaharai hospital following artillery barrage on two refugee camps Saturday, succumbed to her wounds as the hospital was refused permission by the military to transport the critically wounded to Valaichenai hospital through Mankerny SLA camp. 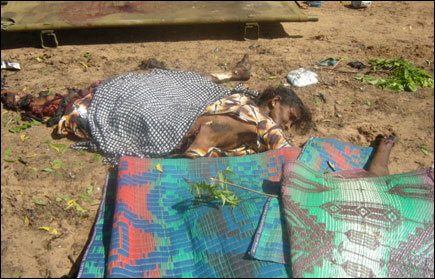 IDPs killed in Kandalady were buried without legal procedures as indiscriminate shelling continued. Five boats were engaged Sunday morning in an attempt to transport the critically wounded, but the heavy shelling from gunboats in the seas off Vaharai, scuttled the attempt. Hospital staff had again urged for transport via landroute for critically injured, medical sources said. The biggest military offensive, launched by the SLA this year in Trincomalee, imposing an econoimic blockade on 40 000 civllians in the region and denying access to NGOs and closing down the gateways, has continued for more than two months.